The impact of the recent floods in Thailand upon hard disk drive (HDD) production in the fourth quarter of this year means retailers world-wide are bracing themselves for PC shortages in the run up to Christmas. Production at two of the world’s largest HDD makers – Western Digital and Seagate – has been badly hit by the flooding (the worst in the country for more than a century), and it could be well into 2012 before they fully recover to normal output. Toshiba and the HDD motor supplier Nidec have been affected too, with Nidec’s manufacturing facilities being inundated with water. The HDD shortage is set to hit Notebook PC assembly/production the worst – sourcing HDDs from other suppliers will result in inevitable price rises. The floods in Thailand have caused short-term price increases for all types of PCs, and will create shortages when manufacturers’ strategic stock runs out. Could these shortages and the resulting supplier or sub-assembly supplier workarounds have been avoided? Did the PC manufacturers really understand the magnitude of their individual and collective dependency on one HDD supplier? It’s the whole IT industry being impacted; those PC manufacturers who were most prepared with their contingency planning should be the ones that will fair best. For some computer manufacturers and media player, set-top box and stand-alone hard drive producers, performing a supply chain risk analysis and quantifying the exposure (by sensibly investing in contingency planning/mitigations) before the floods will be feeling like their smartest business move ever now; acting on analysis findings will be providing them with a real competitive advantage. Risk assessment and supply chain analysis is surely a ‘no brainer’ now? Granted, the challenges facing companies in the technology industries (re: building resilience in their supply chains) are huge, with many firms claiming that, the speed of innovation is so steep, they never really have the time or resources to build true redundancy into their chains. 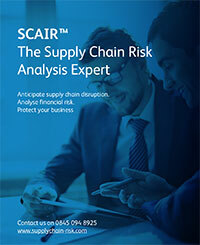 But surely the lesson from the Thailand flooding catastrophe is that making time to risk assess and analyse supply chains (by using a simple and effective tool like SCAIR, which helps to make sense of a complex area of risk) has to be at, or near, the very top of every type of aforementioned manufacturers’ ‘jobs to get done’ priority list from now on? Or at least well before the first raindrop of next summer’s Southeast Asia monsoon gently falls?